NEW WATER WELL IS A REAL GUSHER! 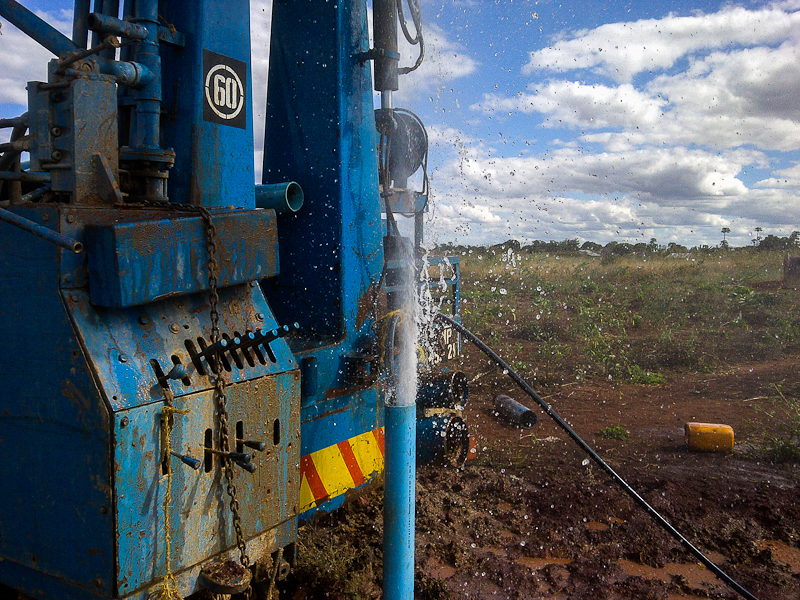 On Tues­day, our water well drilling team hit an abun­dant water source at 47 meters (141) on our 40 acre prop­erty in Balama. Why the new well in Balama? 1. Our 2 present wells at our base are VERY shal­low and can­not meet the grow­ing needs of our orphans. 2. Over 200 fam­i­lies depend on our church well, as our 40 acre base is the ONLY OPEN LAND in the area, as houses have built up all around us. 3. A new well with ABUNDANT WATER was needed if we are meet the kid’s needs, AND start our new project for “water based food gar­dens” in the com­ing months. WE ARE MOST GRATEFUL to the FOUR FAMILIES from north east Texas who pooled their resources to pro­vide this water well for us. THANKS hardly expresses my JOY as I stood in the spray of this GUSHER as the drillers flushed it out yes­ter­day to see how much water it con­tained. 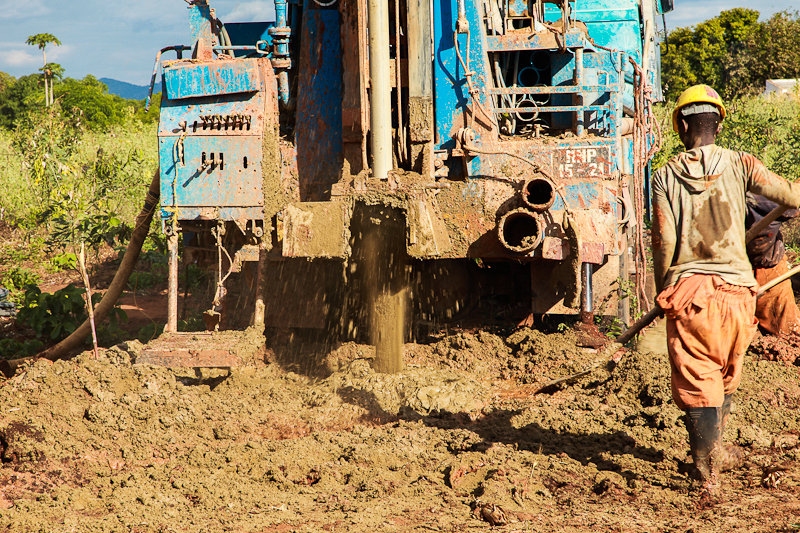 The drillers esti­mate over 2000 CUBIC METERS of water per hour can be pumped from this deep under­ground cavern. Com­ing here to drill this well TRULY BLESSED one of the lead­ers on the drilling team. Last year, I’d wit­nessed to this same drilling team, but it was like talk­ing to brick walls as they are all Hin­dus or Mus­lims. This year, a new man, named Aaron, replaced on of the team lead­ers. 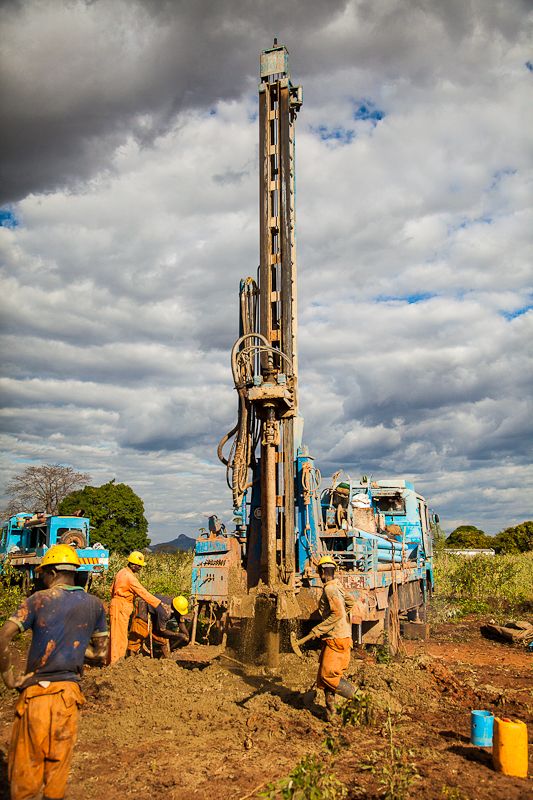 Aaron and I talked off and on dur­ing the 3 days of drilling as he speaks good Eng­lish and Por­tuguese. As they were flush­ing the well Tues­day after­noon, Aaron came and got me to show me the won­der­ful clean water shoot­ing up to 20 feet out of the well! It is a sight to see, just like the old GUSHERS you’d see when they first struck oil in Texas. It was FUN to stand in the cool spray being blown by the wind, and watch that tower of clear water bless the crops. I told him I only had a pocket ver­sion (from Gideons), so I went back to the house to fetch it. The box of Eng­lish Bibles is rarely needed here, so these Bibles were in a box 8 FEET up on the top shelf in my store­room, and I’m not quite tall enough to reach it even with a step lad­der. J But I man­aged to get the box open and stretched to my full height, reach­ing in blindly to grab a small pocket Bible. MY HAND TOUCHED A FULL SIZE BOOK, which I didn’t expect! I pulled the book out and it was a com­plete NIV BIBLE IN ENGLISH! I thought WOW, I guess God plans to use ME to answer this man’s prayers, as I had no idea how this Bible got into this box. I gave the Bible to Aaron and he jumped for JOY! We traded phone num­bers, and I plan to keep in touch with him, call­ing him to encour­age him, as he is always on the road with the drilling team (and the only Chris­t­ian on this truck). That Bible and those tracts will travel with this team ALL OVER North­ern Mozam­bique until Decem­ber this year, when they have to stop for the rainy sea­son. After they left, I felt in my spirit that God was telling me we had just equipped a new Evan­ge­list for Him. With many lonely nights ahead of them, I know those comic tracts will be ready over and over. 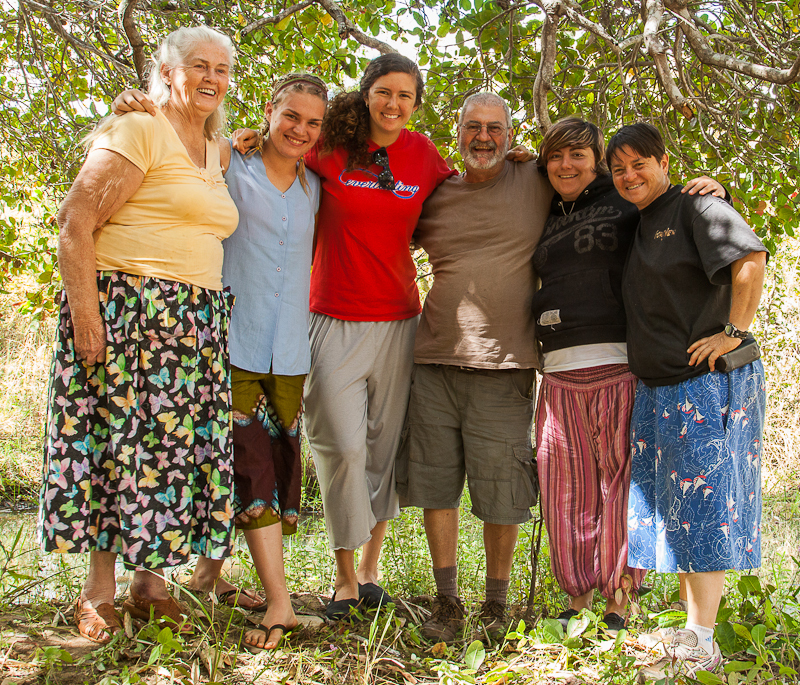 Our prayer is that many of these work­ers PLUS those whom Aaron meets on the road, will come to Christ. Aaron is a really nice man, and a nat­ural talker, so I KNOW God will use his “gift of gab” to reach the lost. Just as the Samar­i­tan woman came to truly know Jesus at a water well, Aaron had his prayer answered at our well. Now he has all he needs to preach God’s Word to the mul­ti­tudes “just as the Samar­i­tan woman did after meet­ing Jesus!” Jesus is truly THE LIVING WATER that washes our sins away. I’m so, so grate­ful that Jesus loves us so much and that He answers our prayers, no mat­ter how small. HAPPY BIRTHDAY TO LINDA STANLEY! We held Linda’s 76th birth­day today at our lit­tle bush camp we call EDEN. It’s our lit­tle hide­away only a 10 minute drive from our base, but since the locals don’t go there, we can have a great party with­out inter­rup­tion. A few cows passed by, but they weren’t inter­ested in us. The menu was chicken salad sand­wiches with fried potato wedges. I took the Ket­sup (Tomato Sauce) as fries just aren’t the same with­out it! TONIGHT at sup­per we have Linda’s favourite cake: our ver­sion of the Pineap­ple UPSIDE DOWN cake. THREE SETS OF TWINS BORN TO GOAT FAMILY TODAY! This morn­ing, Danielle and I went out to deworm 2 Mommy goats who had babies yes­ter­day (1 set of twins and 1 sin­gle birth). Just as I got home from Linda’s pic­nic, one of my goat man­agers, Car­l­i­tos, raced up on his motor­bike to tell me about the mul­ti­ple births cause his phone bat­tery was dead. Danielle, Emma, and Melissa were gone to lan­guage classes, so Car­l­i­tos and I drove out to han­dle the deworm­ing and check the babies. Car­l­i­tos knew I was to leave at 5a.m. on Sat­ur­day for Pemba and wouldn’t return till early Sun­day morn­ing. Deworm­ing the goats within the 1st day after giv­ing birth is VERY impor­tant, since any stom­ach worms present are imme­di­ately trig­gered to pro­duce up to 5,000 worm eggs A DAY due to the hor­mones released in the birth process. So at the moment we have NINE strong baby goats (3 females and 6 males). The 6 new­bies were BAAAing their heads off when we left, look­ing for that won­der­ful drink they call the “Udder Uncola”! That’s a farmer’s joke for mommy’s milk, my friends! On Wed. a “lit­tle birdy” told us to expect com­pany on Thurs­day. We held a quick clean up, as kids will be kids and the rooms are not always mil­i­tary clean and neat. The Balama Admin­is­tra­tor (a woman), came at 9a.m. Thurs­day with 4 cars full of her fol­low­ers. Together we walked the vil­lage in order to visit our Girl’s and Boy’s homes that we built last year. She’d never seen them and dearly loved the ROCKET STOVES the women were cook­ing on. She also vis­ited our orphan’s home that is under con­struc­tion for lit­tle boys and girls under 11 years of age. We really appre­ci­ate our “lit­tle birdy” friends and are very grate­ful for the favour we have with the local gov­ern­ment. Dur­ing our walk, the Admin­is­tra­tor asked me to report to her office at 2pm that after­noon. Seems the bas­ket­ball court at the local high school needs a face lift and new goals. We’ve been asked to “make it hap­pen”, so Mon­day, off we go to start dig­ging holes for the new cement goal posts. We’ll also be haul­ing in 420 sacks of RICE straight from the fields on Mon­day. Noth­ing like a busy day to keep one out of trouble. MELISSA , SITTING PRETTY, ON OUR BEAUTIFUL NEW 50CC MOTORBIKE. On Sat­ur­day, June 22nd, Melissa Olms­dahl will fly back to RSA to get her police clear­ance and Res­i­dency Visa. She returns to us on July 17th to begin her new “Bik­ing Career” as she brings Christ to the Youth of Mozam­bique. 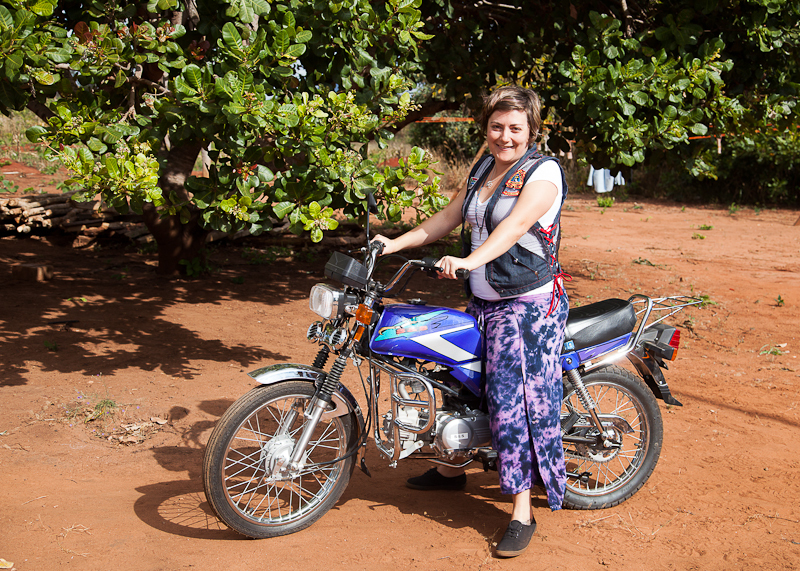 We were blessed last week with a 50 cc motor­bike, that Melissa will use to travel with Car­l­i­tos Jorge, our trav­el­ing Children’s Leader to bring Christ to the 1000’s of kids in remote vil­lages. Our heart­felt thanks goes out to those who made this bike possible. Stayed tuned for more adven­tures next week. Around here, FLEXIBILITY is the name of the game. REMEMBER: THE SHORTEST DISTANCE BETWEEN A PROBLEM AND A SOLUTION IS: The dis­tance between your knees and floor. The one who KNEELS to the Lord can STAND UP to anything! LIFE AFTER CORN BUYING DOES EXIST! 200 TONS of corn in the barn. When the whole team is focused on corn buy­ing for 9 days straight, it can seem like an eter­nity. For this Bunny, here’s my daily time line: Get­ting up at 3:30a.m., get the office work done before weight teams arrive. 5a.m. our 2 trucks and weight teams (28 men) leave for the bush vil­lages where the corn co-op groups eagerly await our arrival. I orga­nize break­fast and lunch for these teams as well as make sure they are fuelled, have drink­ing water, etc. Sort of like get­ting a mas­sive group of kids off to sum­mer camp each day. 5:30a.m. the mis­sion­ary team and I leave for the barns. 5:35a.m. singing, prayer, and an evan­gel­i­cal mes­sage is given to the 65 work­ers (most who don’t know Christ). Got to have our spir­i­tual food so we can start out day. 6a.m. the work begins. The 65 man crew moves up to 500 sacks of corn/day, unload­ing the trucks, run­ning it through the sack­ing chutes, and stack­ing it 13 rows high (14 ft. or 5.5 meters) in our barns. It must be done PERFECTLY or that 100 ton moun­tain of corn WILL come tum­bling down. Our mis­sion­ary team oper­ate the chutes mak­ing sure all the bugs are erad­i­cated before it goes into the sacks. EACH of those 500 sacks (140 lbs. 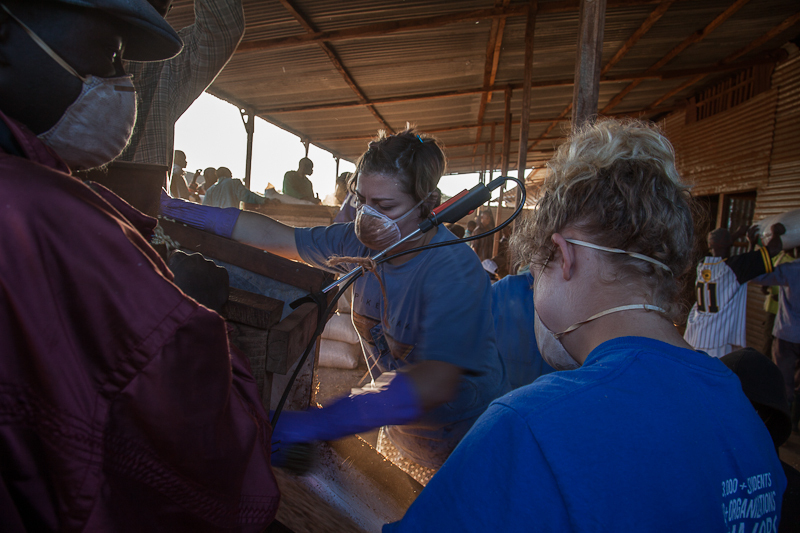 or 70kg) is lifted at least 6 times between the weigh­ing process and being stacked in our barn. That is one rea­son we need so many men, as that is an aver­age of pick­ing up 2,500 sacks in a 5 hours! (about 50 sacks/person so it’s not an over­load). But climb­ing a “lad­der” made of stacked corn to get it up to that 13th row IS A CHALLENGE for all of the men and is very tir­ing. I orga­nize extra men to help on the 2 days we have to “take it to the top”. Lots of prayer goes on before each day’s work for pro­tec­tion from acci­dents. I per­son­ally saw 3 men fall off the “lad­der” try­ing to get the bags to the 13th row. NO ONE was harmed in these falls as the bags fell to the side instead of crush­ing bones. Our angels are “on guard” so that even the unbe­liev­ers go unharmed. I thanked JESUS every day as we com­pleted the work in record time, with no injuries. What we lov­ing call our “Dream Team”, con­sists of Emma Clif­ford, Danielle Van Zyl, and Melissa Olms­dahl. All these girls have youth min­istry expe­ri­ence. With Eric’s and Linda’s help they did a great job of orga­niz­ing their first “Youth Night”, show­ing the movie: THE CROSS AND THE SWITCHBLADE (in Por­tuguese). The church was packed out! We plan a 2nd Chris­t­ian movie next Fri­day to get draw more young peo­ple. After that, they will orga­nized games and evan­gel­i­cal pro­grams to help these teenagers find Christ and learn to walk accord­ing to the Bible. P.S. Bre­anne Bram­mer returned to the USA on Wed. due to a diag­no­sis of “com­pli­cated malaria”. She is now safely back at her home. We wish her a speedy recovery. Melissa, 25 year old Youth Direc­tor from George, S. Africa, is top notch at work­ing with young peo­ple. She has com­mit­ted to a year and will return to us on July 17th, as it will take sev­eral weeks to get her police clear­ance and other required doc­u­ments in order. WELCOME ABOARD, Melissa! 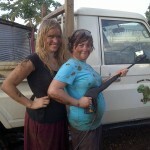 DANIELLE AND MELISSA’S ENGLISH LESSONS HAS THEM SPEAKING MAKUA! 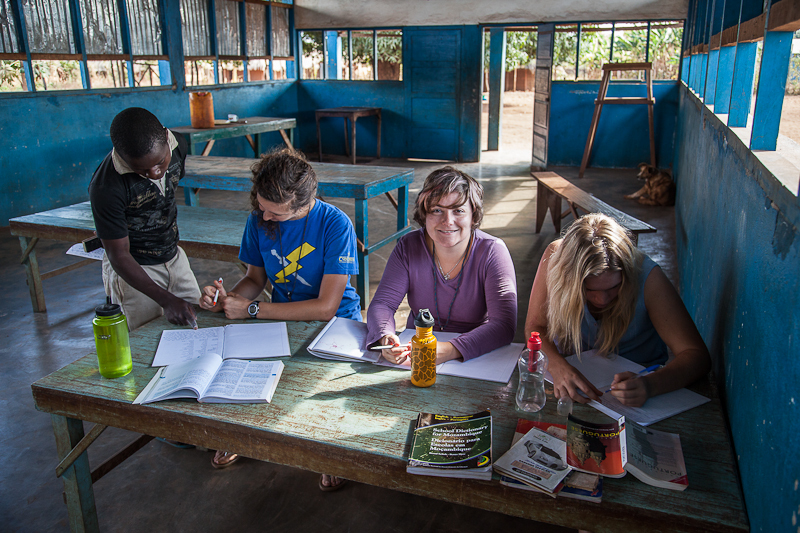 Nel­son teach­ing Makua and Por­tuguese to Emma, Melissa, and Danielle (sit­ting in our pro-school class­room) cause it has a black board. Nel­son, my won­der­ful 16 year old orphan inter­preter, has now turned lan­guage teacher! Nel­son desires to fol­low in my foot­steps as a Preacher/nurse/interpreter. His first chal­lenge is to learn Eng­lish, so I asked the girls to teach him. The Lord impressed on Melissa that she must learn Makua. Next thing I hear, is that they are swap­ping lan­guages! All 3 “student/teachers” are learn­ing at a fast pace. Our meals are now a mix­ture of 4 lan­guages, mak­ing it a bar­rel of laughs. You’ll hear Eng­lish, Africaans, Por­tuguese, and Makua. But Emma and I don’t stop there, as we usu­ally throw in a bit of Texan when we sing the “HEE HAW TV THEME SONG”. Now the whole team knows it. Linda even does the HEE HAW shout with a fancy leg kick! P.S. Linda’s birth­day is June 22. WHY LEARN MAKUA? Because it’s the local lan­guage spo­ken by EVERYONE in the vil­lages. What bet­ter way to teach the Word of God, than to learn it so you don’t depend on an inter­preter like I do. Both these young ladies and Emma, who speaks Span­ish, are also study­ing Por­tuguese from our com­puter taught coarse. Our Inter­na­tional Vic­tory Bible School has been in ses­sion for sev­eral years, teach­ing God’s Word to new con­verts in the vil­lages. This week our ener­getic young peo­ple have now started an infor­mal Bible School via DVD for our mis­sion­ar­ies. Each per­son can take it at their own pace to enhance their under­stand­ing of God’s Word. THANK YOU VICTORY CHRISTIAN CENTER for pro­vid­ing us with these classes. OUR DREAM TEAM IS DEFINENTLY AN ENERGETIC ONE! They remind me of intel­lec­tual sponges, with the speed at which they are learn­ing. 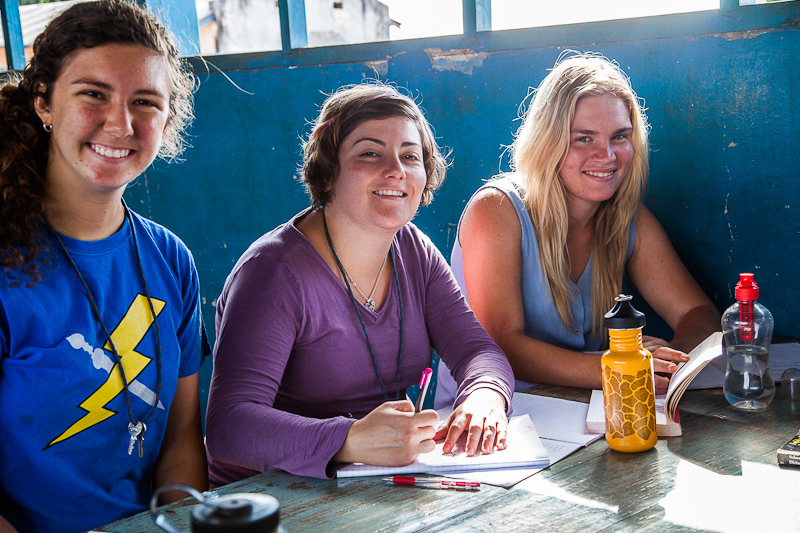 Emma and Danielle just com­pleted 30 days in Moz., and Melissa just joined us on June 1st! No grass grows under their feet for sure! 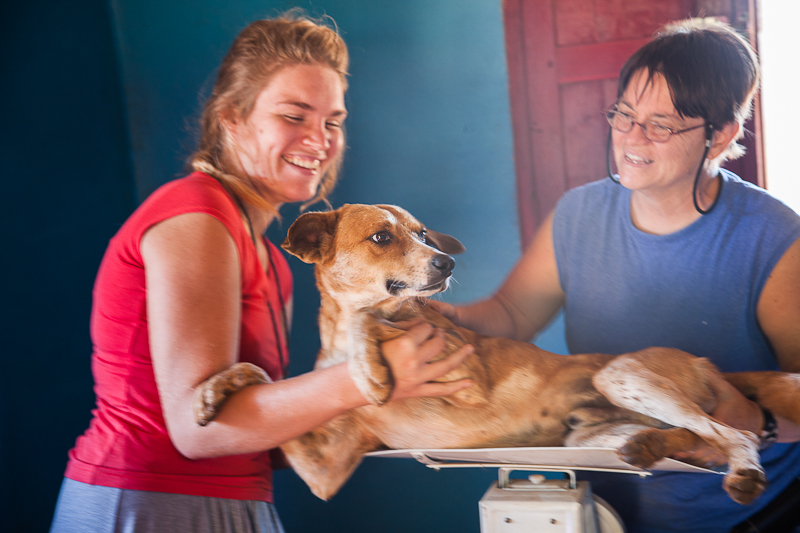 Danielle and I weigh­ing Toto on our baby scale. He got in a dog fight and needed an injec­tion (dosage by weight) and this was the only scale that would weigh him. 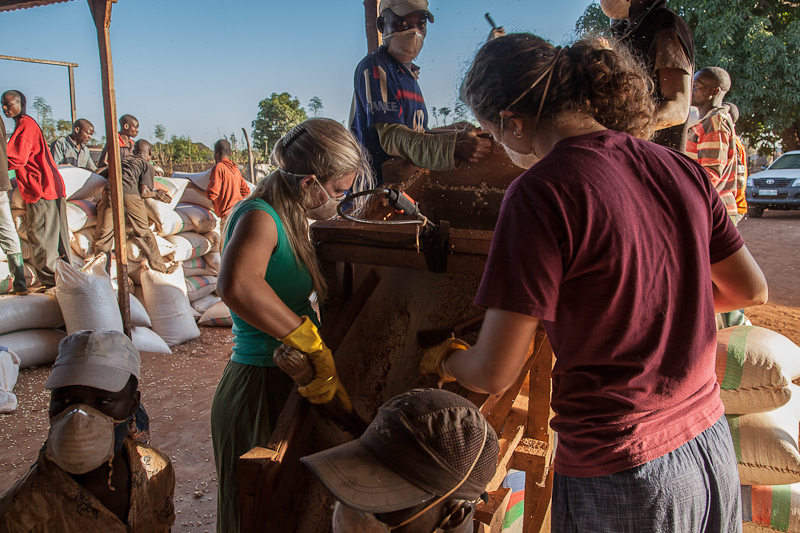 Our team of 90 men, 2 trucks, and 4 young ladies pushed an amaz­ing 167 TONS of corn into our barns this week! Just 35 tons remain in the field for the June buy­ing sea­son. Meluco’s price war was very intense, but Sylvia, our orphan­age man­ager, was able to res­cue 30 tons of corn before com­mer­cial buy­ers could get it. 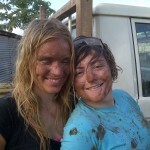 The 4 young ladies help­ing us have been real troop­ers as it’s a dusty, dirty job. The cool sea­son is upon us, so the temps are in the low 70’s each day, mak­ing it eas­ier on all of us to get through the intense 5 hours of corn pro­cess­ing each morn­ing. These men are unload­ing and stack­ing over 500 sacks of corn a day. Those bags weigh 140 lbs. (70KG) EACH! Moz. men are tough and VERY STRONG. Linda Stan­ley took the girls “shop­ping at our local MALL today”. That’s our “nick name” for the local out­door mar­ket in bustling down­town Balama! They bought me a new “Caplana” with a map of Mozam­bique on it. A Caplana is a 100% cot­ton cloth in vivid col­ors that makes a wrap-around skirt for the local women or in my case, a new table cloth for my book table. Emma and Bre­anne have opened a “shade tree Eng­lish class” on Sat­ur­day after­noons, so they are busy teach­ing verbs to 3 of our youth who help as inter­preters when I teach in the villages. One of our Land Cruis­ers is due for its yearly inspec­tion in Pemba this week, so Danielle and Melissa are out “play­ing” with Eric’s high pres­sure water sprayer that turns a bar­rel of water into an instant CAR WASH! The girls came laugh­ing into the office just now to tell me they were fin­ished, and to show me how hard they worked. The LC looks GREAT! But “Mama Brenda” sent the girls straight to the show­ers as it looked like they’d had a mud-slinging con­test! 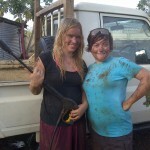 Guess I’ll have to hide the sprayer on Sat­ur­days as I’m sure they’ll be vol­un­teer­ing to wash the 6 ton truck next! Not sure we would rec­og­nize them after that big job. From the sounds of wild laugh­ter com­ing from the women’s quar­ters, the fun must be con­tin­u­ing in the showers! Linda Stan­ley is in the kitchen, as I hear pots and pans bang­ing. She’s mix­ing up a batch of her home­made GOAT ENCHILADAS for sup­per tonight. YUMMY! This Bunny can hardly wait. That life here in Balama on a quiet Sat­ur­day after­noon, where “fun” can be found if you just look for it!